The end of the season is rapidly approaching, and I’m not ready for it to end. I’ve had a fantastic time this year with my friends and family. It’s awesome to share the woods with Smitty again. We haven’t hunted together in about 12 years. I forgot how much I enjoy his company in the woods. It seems like we haven’t missed a day in the woods. I’m thankful for the days I got to share with him in the woods this year. I’m hoping that he decides to hunt with us more often next year. He headed home tonight to celebrate his wife’s 50th birthday. Today passed quickly. I jumped one deer while still-hunting but never got a look at it. I still haven’t spotted a bear, even though I’m seeing all sorts of bear sign. I guess I’m just not a seasoned bear hunter. I’ll have to improve the craft before I actually think I know what I’m doing. I’m wondering if bear hunting is just a lot of luck. I’d imagine theres a trick to the trade, but I haven’t figured it out yet. Patrick Duffy stopped into camp last night. He’s a good guy, and I like him a lot. I like talking to intelligent people who are willing to listen, learn and teach. I’m impressed with the skills he has picked up in the short amount of time that he has hunted. He seems to understand a lot of things, and he looks to increase his knowledge each season. I can route for guys like that, just as I route for Caleb, who killed the buck I named Hollywood. I enjoy watching young Adirondack hunters who put in the extra effort. Although I’m not old, I remember the days when I was their age and did what I had to do to put big bucks on the ground. Caleb did everything he had to do succeed this year, and the proof is in the pudding that he did the right things. I’m impressed with the path he took to reach his goal. It appears that he will make the people around him better hunters as they move forward. I enjoy talking to him and sharing things with him because he gets it and not many people his age really get it. I have a feeling he will find success again in the future, the very near future. People who are always willing to learn and put the time in find success. They don’t use other people and approach things with a cocky know-it-all attitude. I appreciate the questions and willingness to learn. His success is my success. We didn’t see much today, but I had a great day in the woods. I covered a lot of ground today, and I feel good about what I found. I’ve enjoyed the scouting process since I’m not really hunting. I’ve also learned that I haven’t been paying as close attention to detail that I usually do. I’m not sure if that’s a good thing. I have to pay more attention. Tomorrow will bring a close to tour rifle season in the Adirondacks. It has been a learning experience, and I’ve had a great time with my father. 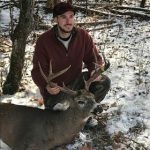 This season felt a lot like some of the old seasons when big bucks fell consistently to the floor of the ADK forest when we took our extended vacations and never left our home state. I do miss those days. I’m glad I have those experiences to share with people. We will see what tomorrow brings. We are headed into some new areas to check things out for next year. This entry was posted on Monday, December 4th, 2017 at 6:42 pm and is filed under Uncategorized. You can follow any responses to this entry through the RSS 2.0 feed. You can leave a response, or trackback from your own site.